The beheading of 82-year-old archaeologist Khaled al-Asaad by Islamic State (IS) was met with universal disgust. Asaad worked as the chief archaeologist of the Roman temples, tombs and theatre at Palmyra for over 50 years and allegedly refused to leave the 2000 year-old ruins out of fear for their destruction ; a fear shared by archaeologists and historians worldwide. The destruction of antiquities is one example of IS extremism, where the group deems cultural artefacts as heresy to its ideology. UNESCO has condemned the group’s campaign of destruction, with director-general Irina Bokova describing it as the biggest loss of historical objects since World War II . The destruction has been documented by former Australian Ambassador to Syria and Lebanon  Ross Burns, who is also an Adjunct Professor in Ancient History at Macquarie University. However, there are suggestions that Asaad’s murder wasn’t simply ideological. According to some reports, Asaad refused to assist IS loot Palmyra antiquities  to sell on the black market. 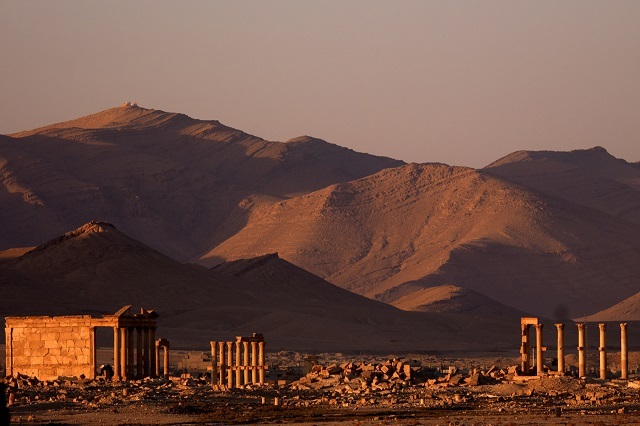 The director of Syria’s department of antiquities and museums, Maamoun Abdulkarim, told CNN that the archaeologist was executed after refusing to tell militants where the treasures of Palmyra were hidden . This suggests that IS has a dual attitude towards antiquities. The demolition of fixed artefacts on ideological grounds is an outward display of their violent extremism. However, the destruction of historical sites like Palmyra may also serve as a smokescreen to allow IS to move other more transportable antiquities to where they can be sold to create finances for the group’s activities. The looting and selling of antiquities was cited as one source of IS revenue by the US Department of the Treasury, along with oil sales, kidnapping for ransoms and extortions. While this isn’t the only source, a diverse and deep revenue base has seen IS become ‘probably the best-funded terrorist organisation’ the US has confronted. The raid of a dead IS commander’s home in June 2014 by Iraqi intelligence officers found records of the group’s financial transactions which indicated that up to US$36 million had been derived from activities which included the smuggling of antiquities  in just one region of Syria. It’s difficult to ascertain to what extent IS is financed by antiquities trafficking. The Financial Action Task Force reveals that IS earns its income not just through selling artefacts, but also by taxing the antiquities’ movement through controlled territory . The University of Glasgow’s Simon Mackenzie points out that private buyers of black market antiquities see the practice as a ‘victimless crime’,  indicating that the impact of looted antiquities isn’t reaching its market. So what can be done to cut off this method of terrorism financing? First, states need to reaffirm their commitment to international measures countering terrorism financing and preserving cultural artefacts, which has already been addressed by a number of United Nations Security Council Resolutions. UNSC Resolutions 2170 and 2178 compel states to suppress the financing of terrorist groups, whilst 2199 condemns the destruction of cultural heritage. International commitments need to be met with action. So actors need to look at factors which facilitate the illicit artefacts market. Trafficking Culture , a research program at the University of Glasgow and funded by the European Research Council, has undertaken number of projects which attempt to understand  and measure  the international market for illicit cultural objects. Another of their projects looks at the laundering of looted goods from the illicit to licit markets . Research projects by groups like Trafficking Culture might be worthy of government engagement and support, with the goal of discouraging would-be buyers by clearly articulating the link between antiquities trade and terrorism financing. We also need to address the diversity of terrorism funding through bilateral and multilateral cooperation. One such initiative will be undertaken by Australia and Indonesia in November, with their respective financial intelligence agencies, AUSTRAC and PPTAK (Indonesian Financial Transaction Reports and Analysis Centre) co-hosting a summit to seek regional arrangements to share financial and other intelligence  to track and shut down syndicates financing foreign terrorism fighters and violent extremism. The transnational nature of illicit goods trafficking means international cooperation is vital to cut off the movement of goods and finances. Given that those who traffic in or purchase illicit cultural artefacts eventually enter the regulated financial system  to process payments, it’s worth considering deeper engagement with the international financial sector which unwittingly facilitates the transactions. This could be led by the Financial Action Task Force who have already expressed their concerns about this method of terrorism financing. To some, protecting artefacts in IS-controlled territory may seem a low priority compared to the slaughter of innocent people. But the preservation of culture serves two significant purposes. Removing access to valuable antiquities cuts off one source of revenue to IS, with the potential to delay their funding and activities. Furthermore, preserving the culture and history of the region will be key to post-conflict recovery and promoting a national identity distinct from the violence which has plagued the region. Clare Murphy is a researcher in ASPI’s Strategic Policing and Law Enforcement Program. Image courtesy of Wikipedia.